You can make tomato sauce out of numerous kinds of tomato, but if you want delicious sauce, go with a paste tomato. They tend to have a firmer, meatier texture than other varieties, and they usually have fewer seeds and less water content, too. That'll mean less prep work and cook time for you, plus more sauce for your money. Read on to learn the nine best paste tomatoes to grow or buy. The following tomatoes share a similar shape, but there are differences in taste, which is especially important when you're planning to make tomato sauce. Amish Paste: This tomato is similar to Roma tomatoes, but it's sweeter with a fresher flavor. It can grow up to 8 to 12 ounces. Opalka: This Polish heirloom is far richer and more flavorful than most paste tomatoes. It's a long, pepper-shaped type with fruits that grow to 4 to 6 inches long. Polish Linguisa: This tomato, as the name implies, is a Polish heirloom. It was brought to New York by Polish gardeners in the 1800s. Big Mama: This plum-shaped, meaty tomato is enormous, growing up to 5 inches long and 3 inches across. Jersey Devil: This heirloom, bred to be used as a paste tomato, is shaped like a banana pepper. It's very juicy and grows to about 5 to 6 inches in length. Jersey Giant: This heirloom paste tomato is rare, but if you can find it or plan to grow it, it's an excellent option that yields plentiful harvests and grows to be 4 to 6 inches long. Roma: This tomato is probably the classic in Italian cooking. It's popular for canning and making tomato paste, but it's not as sweet as some of the similar heirloom tomatoes (such as Amish Paste) mentioned on this list. San Marzano: Considered the classic paste tomato, the San Marzano has a dense, almost dry, sweet flavor. Legally, and to be called a San Marzano, this tomato has to be grown in Valle del Sarno, the "Valley of Sarno," in Italy. If you'll be growing your tomatoes, it's easy to order seeds for any of the varieties mentioned. But, if you'll be buying your tomatoes, your choices will be limited. Buy directly from a farmer or stop by a farmers market for the best selection. Locally grown tomatoes are bound to be riper than anything you can get at the grocery store. Most of the tomatoes on this list are determinate varieties, meaning they tend to ripen at once. That's ideal for sauce making and paste making. So plan to stop by a farmers market at the end of the day, and you're likely to find farmers ready to negotiate, especially if you're looking to buy a lot. 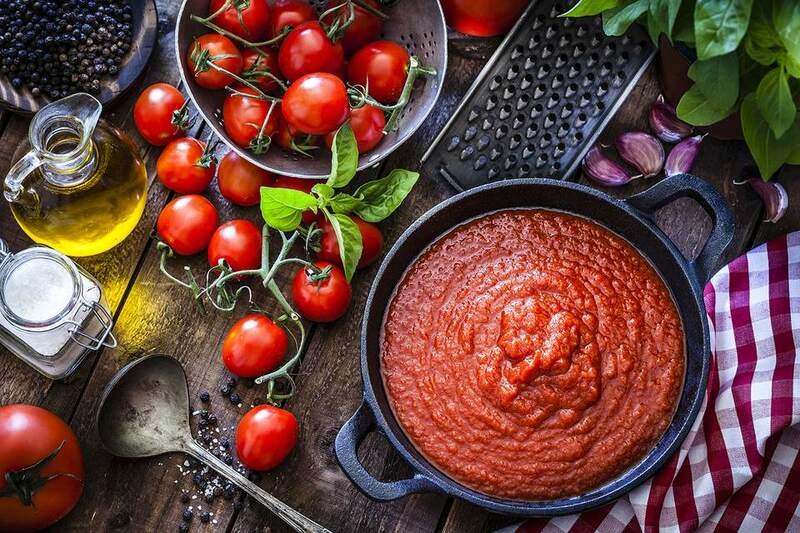 If you're going to grow or buy tomatoes to make tomato sauce, take the time to learn how to make the sauce at home on your stovetop. It's also easy to make tomato paste. If you like the idea of making your tomato sauce, but you're not excited about all the work, you can make tomato sauce in the slow cooker. The process is simple and requires no coring, seeding, or peeling, and you won't have to stand over a hot stove. If you've made more sauce than you can use at the moment, can your tomato sauce. Just know that you'll need to add lemon juice to your sauce to increase the acidity. Modern tomatoes aren't as acidic as they used to be. You can also freeze your tomatoes until you have more time to deal with them. Some canners (farmers especially) are in the habit of freezing their garden harvest, so they can wait to process it in the winter when life slows down a bit, and a warm kitchen is a welcome respite. What Is the Difference Between Coarse Salt and Table Salt?